In this topic, we review the features of stock index trading for beginners. Stock indices attracted my attention in 2007 when I began to analyze them and discuss them at one forum. The forum thread has existed for more than five years, there was accumulated a huge amount of certain material - and even one time I would like to write a book on this topic. I am sure that most traders do not trade stock indices only because they do not know these tools or because of their currency habits and conservatism of thinking. But after reading the material, and most importantly, starting to trade in practice - many will discover completely different and new world - and they will just start to love stock indexes as an excellent trading tool. This material has never been printed before. I am writing it straight from my head, without any sources, using only my own experience and knowledge. It is not a secret that such trading tools as stock indices are not very popular among traders. Usually, this is due to the weak “promotion” of stock indices, because everyone knows Forex (foreign exchange market) and recently on the market also have appeared cryptocurrencies. In addition, many experts are saying that there is not enough analytics and technical analysis on this topic. Whatever it was, but the fact remains the same: such a rather interesting trading tool passes beside the sight of the majority of traders. However, in the USA mini-contract for the stock index, S & P 500 (EC) is the most popular trading tool among traders, it has the highest trading volumes and open interest on the Chicago Mercantile Exchange (CME). Let us explain that we are usually talking about stock index futures, more precisely, CFD on them - and the stock indexes themselves are not traded. But further, for our convenience - we will simply talk about stock indices, without mentioning that it is a futures or CFD on it. Firstly, we will give the definition of them and we will touch upon, among others, some concepts of the futures and stock markets. During the process of their describing, we will try to speak in a simple and understandable language so that even a beginner or not very familiar with the topic person will be able to understand everything. Stock index reflects the value of a certain group of shares, selected and calculated in a special way. This is a kind of stocks "basket", as there is, for example, the dollar index, consisting of some currencies. The stock index is usually not traded - futures are traded on it. This word can frighten off newbies by causing misunderstanding. Futures is a kind of trading contract for the supply of goods in the future - in a month, a quarter, etc. Futures are traded on the stock exchange, it is a stock exchange instrument, unlike forex, over-the-counter market. Futures on a stock index is a traded contract that has a stock index in the "underlying asset", which differs from it by a certain amount. Futures are deliverable (using which you can get a certain product when they expire) and non-deliverable. Futures on stock indices are non-deliverable, it is impossible to get an index on them. Futures on stock indexes (nearest) usually expire (become out of action) every quarter, this is called “expiration” or the expiration of their validity period. In the case of US indices, this usually occurs in the middle of the last month of the quarter (March-June-September-December). CFD on stock index futures, this is a contract for the difference in prices, and by and large it will not differ from stock index futures substantially. The only difference is that real futures are traded on the futures exchange, they do not have fractional lots (only whole ones) and each sale is issued approximately the same as the sale of shares. CFD is usually traded in DC and does not have all of the above qualities. It does not bear the right to receive delivery on it, it is not issued on the stock exchange and etc. But it may have some additional advantages, for example, fractional lots (in order to reduce the cost of the opening collateral). Real futures have no fractional lots. I will make a note that there are even stock indices on the spot, it means, that outwardly they are equivalent to real stock indices, but they have some features for long-term trading, for example - the absence of a swap (payment for transferring positions in a day), which can greatly reduce profits with long-term retention of positions. But such tools are met quite rare. Is there leverage in futures? Futures have a margin, but do not have the leverage, which they have in forex. For example, the pledge for a mini-contract on the stock index S & P 500 (has a "ticker" EC) is 5800 dollars. Leverage, while (if calculated) will not be as big as in Forex, about 30-40. Mini-contract differs from a regular contract by a lower amount of collateral — for example, a “regular” contract for the S & P 500 stock index will have a much larger margin — $ 29,000. In addition, cost of 1 point of mini-contract is two times lower than 1 point of a regular contract, although the deposit is five times lower. That is, with the help of mini-contracts you can more efficiently use a deposit for opening positions. 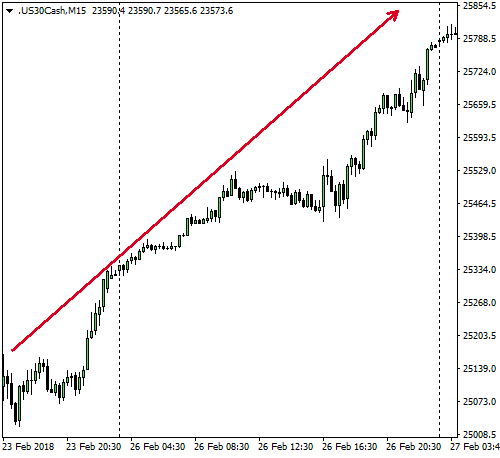 That is why mini contracts on the S & P 500 stock index is so popular in the US among traders. What is the difference between stock indices and forex and its currencies? Equity or equity markets are usually growing markets, unlike forex (a flatter market), where trends are less common and most of the time trading is in the sidelines. Stock indices usually grow slowly and for a long time - but they fall rapidly and sharply (this is another feature, we will discuss it below). The second feature follows from the first - stock indices are more trendy instruments than currencies. Moreover, they are more trendy in any time interval - within a day, or within a week, month or year. If the indices grow, they can grow throughout the session with almost no kickbacks and just as well they can fall. That is why it is very difficult for forex traders, who are used to lateral movement, to trade FI. Stock indices have a pronounced seasonality of trade. In some months, they mostly grow, for example, in December (the so-called Christmas rally) - and in others they usually fall, for example, in May or October. Stock indices have movement patterns intraday, which are associated with the beginning, middle and end of the trading session. For example, strong movements in the first hour of the American session. Stock indices are very technical - and all technical analysis figures, candlesticks, levels, etc. are worked out on them, which in turn have long been crookedly working on Forex, or even stopped working altogether. That's where the sphere to research for technical analysts! Stock indices poorly react to majority of the usual indicators from the Economic Calendar, besides very important ones - for example, data on the US labor market. Therefore, persons accustomed to forex here will have to adjust their views slightly. But this reaction to the indicators, if it is, is much more correct and adequate than in the currency. A strong US labor market brings grow of the indices until the end of the session. And what is happening with dollar at this time? Dollar does not grow, it dangles from side to side, beating out your feet. Besides of usual indicators from the calendar - the indices often react to the reports of the largest companies, which are published once a quarter, for a month and a half (in the case of the United States) in a special quarterly reporting period. Stock indices are much more difficult to manipulate, unlike currency, where there are only mega-large players on the interbank market, that can turn the course to destination they want it and against any news or logic. Forex is an exchanger, and if someone needs to exchange currency, he is not interested in any of our analyzes and TA figures. But the stock index, which consists of dozens of different stocks, is a composite tool - and it is much more difficult to “move” it, if it is possible at all. It is very easy to “move” one share by releasing some rumor or news, but the whole index - no. Next, let's take a closer look at each item. The graph below shows the Dow Jones stock index and its growing trend since the beginning of 2009 when it was at 8 thousand points level. After 9 years, the indices rose already above 26 thousand - an increase of more than three times. No currency can ever be compared with such growth - this is why stock markets are used for long-term investments. Because of this feature of long-term growth, stock indices should always be sold very carefully, or not be sold at all, waiting for good points for purchases. But this is specific only for growing markets. If the trend is turning down, which is extremely rare, in times of crises once in 10 years - then you should already sell it. Using this opportunity, it is much easier to trade (especially for beginners) in this option, than on the side currency market, where an expanding “saw” is usually observed when market makers well collect your stops. What makes such good movements one way, even within a day? The reason for this is the effect of the crowd, a multitude of medium and small investors, which simply do not present in the foreign exchange market, or where only the largest sharks banks operate on the interbank market. In the stock market, there are a lot of investors, and they can buy lots (stocks) worth up to hundreds of dollars, whereas in Forex lots are calculated from millions of dollars. The effect of the crowd has following sense: if the movement starts, then everyone immediately wants to join it. As a result, a single growing impulse follows a new one, and so on until a certain point (sometimes it goes up to the very end of the trading session). Knowing this feature, it is much easier to plan the direction of the upcoming trades, when trading in the medium / long term, for example, on a weekly or monthly period. For example, there is an expression: sell the may - and go away, meaning: sell everything at the beginning of May and have a rest. 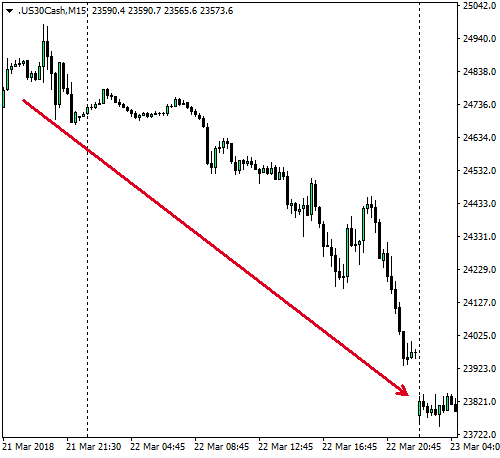 It happened due to the fact that it was noticed that in May usually stock markets are falling. So, it is necessary either to fix purchases or even to open sales. Summer is usually a period of stagnation in the stock markets. The end of the year, on the contrary, is the period of active growth before Christmas and the end of the calendar year, when funds usually sum up the past year and they need to show the maximum profit. Lets review more detaily the US stock indexes. I do not recommend European indexes for trade to beginners, but later I will explain why. We will make a reservation in advance, that here and below will be used Moscow summer time. In winter period for Russia, it will be necessary to add one hour to specified below time. For example, the beginning of the stock session in the US in the summer is at 16:30 according to Moscow time - and in the winter at 17:30, an hour later. The change of time by an hour is due to the fact that Russia refused to switch to summer time. And so, we will review later the American stock session more detaily. Bidding takes place from 16:30 to 23:00 h.
Lunch break (if it can be called like this) usually lasts from 19 to 20 h.
Two hours of the trading session are the first and last one. This is the time when institutional investors (the largest banks and funds) trade - and then it is usually observed a strong movement. In the first hour, from 4:30 pm to 5:30 pm - this movement is usually much stronger than in the last hour. And if the market is growing, then in the first hour of trading there usually can happen growth. Knowing this feature, you can successfully trade only in the first hour. However, often, indices (in the form of futures) are growing already in the European session together with Europe - and the shares are opened with a gap up, which can sometimes be closed, in whole or in part. That is why it often happens that with such an opening, in the first 10-15 and even 30 minutes, there may be a decrease in the indices. After that growth resumes. And growth very often comes before lunch, which begins at 19 o'clock. Another feature: almost always, after the completion of the first hour of trading, indices may begin to decline. This should always be kept in mind. The decline is caused by the sales of small traders after the institutions have raised the price higher. The decrease may be small, 5-10 minutes, after which the growth continues. But it also happens that a real reversal follows and the indices after fall even below the opening point - this is if the market is weak and falling. "Lunch break". From 19 to 20 h. Trading activity at this time usually falls, previously growing market may interrupt growth and even begin to decline slightly. If the growth momentum is strong, there can be almost no decline. Time after lunch. Starting from 20 o'clock, the market may sometimes turn down and you have to be careful. But in any case, something is happening: growth continues, after a weak "lunch" correction and daily movement either rolls down, or even reverse. The last hour of the trading session and the second hour of "institutional" trading begins at 22 o'clock. And here often can be a reversal of previous growth, when large funds fix a part of the profits. But there may be a slight increase - or a slight increase followed by a slight decrease. In any case, this hour of trading is much less interesting than the first hour of the trading session. Why trade should not happen outside the stock trading session? If the market, especially after the decline in the previous day, begins to grow already in Europe - sometimes it happens that it possible to find a good entry point already at this moment. However, as practice shows, this is not so often - you can easily go into the negative, or knock out the stop in the breakeven. That is why it is better not to be involved, especially for beginners, to trade in the European session and especially in the Asian one. It is better to adhere strictly to trading strategy within only the American session. In the future, obtaining more experience, trader can expand time. But for a start it is better this way. Last edited by Gulfstream; 10-08-2018 at 09:05 AM. If you start to observe stock indexes, you will be amazed how technical they are. There are a plenty of examples in practice, but I will try to show some of them. On the top are located three major US indices: DJIA, S&3P 500 and Nasdaq, the most outstanding is Dow Jones Index (blue chip index), which is, by the way, the oldest stock index in the world with the largest history of quotes. we will discuss it more details below. Usually, there is almost no reaction to macro indicators, and even if it exists during the 15:30 news release (even before the opening of the stock session), then a slight decrease (or increase) almost immediately disappears. Sometimes inflation data can cause movement. Inflation growth and interest rates increase in theory are always bad for the stock market (in opposed to the currency market, where this process in inverse). But data on the labor market on the first Friday (Nonfarm Payrolls) almost always cause a fairly strong reaction if it differs from the forecasts - and this reaction is “correct.” Agian, in contrast to Forex, where due to a strong US data dollar suddenly begins to decline. The quarterly reporting periods for US companies are a special time for the stock market. It means that settled growth (in the case of a growing market) can be replaced by a storm and sharp movements of individual stocks, which rapidly react to various indicators of their reports for the quarter. Such strong movements of individual stocks are rarely strongly reflected on the indices as a whole- this is another advantage of indices over stocks. Although stocks go better, they fall even more unlike the general stock index. Although there are also strong movements on the indices, if suddenly, for example, there is a change in price on “heavy” papers, such as Apple or Google stock. Starting time for such period is the first month of the quarter and the second week of the month. Earlier, it was Tuesday (about the 9th day of the month), when Alcoa first published its reports. And the beginning of this period was counted from this report. But then, Alcoa has removed Dow Index and even changed the time of report release. Now the beginning of the reporting period is considered Friday of the second week (instead of Tuesday), when reports of the largest US banks are issued. Usually, it is 12-13 day of the month. Traditionally, the reporting period ends with release of the report by the Walmart retailer in the middle of the next month after the month of the beginning of the season: February - May - August - November. At least previously, there were several movement patterns of the indices during such periods - from growth to decline and the average option: the growth in the beginning, followed by a decrease. In recent years, the increase has been observed mainly during such periods, which is associated with the emergence of new reasons for growth in the form of good reports. Why at first it is better not to trade with European stock indices? Once, about 10 years ago, both American and European indices moved almost identically, but European ones went even better ( in percentage terms). However, in recent years this is far from being the same. European indices are growing much worse than American ones, this can be seen at least last year, when American ones grew almost non-stop - but European ones grew in 2 times less. The obvious fundamental reason for this is the rumors about the imminent curtailment of the European program of quantitative easing (QE), which in many respects made it possible to channel significant funds to banks in order to buy stock assets. The same factor, by the way, has caused the growth of the euro on the foreign exchange market over the past year. Previously, various debt crises in the countries of Ireland, Portugal, then in Greece, etc., prevented European stock indices from growing. Anyhow trading with such indices is extremely difficult policy, which sould be avoided by beginners, before they will obtain necessary experience and knowledge. The American market was simpler in recent years - it grew almost without stopping. This allowed to trade using almost one button "buy" both within the day, week, and long-term. We need a fundamental analysis in order to understand the causes of the tools movement, because trading, using only technical analysis, although is possible, but it is similar to movement in the dark without light. Fundamental analysis of stock indices differs from the analysis of individual stocks included in it. In order to trade stocks, we must (preferably) know the specific indicators of this company from the latest reports, its dynamics, prospects of the company and forecasts, etc. It is quite difficult and it is a large array of information, which is often difficult even to get. In the case of stock indices, the situation is a little bit simpler - they are traded closer to the currency and are based on some general characteristics of the economy and economic factors. For example, the indices growth in 2017 was caused by the expectations of Trump's tax reform, which should lead to an increase in company profits (due to tax cuts) - as well as to good performance indicators for companies and expectations for their growth. This is a certain averaged index, which is calculated basing on the results of the reporting season and is forecasted for the next quarter. But in a more general form, stock assets growth is driven by a slightly different indicator. What drives stock assets growth? This is usually the case, however there are exceptions caused by some sudden extraordinary fundamental events. For example, an event happened this weekend. One Sunday evening, The Wall Street Journal reported that the authorities of China and United States, without undue publicity, began negotiations with a goal to improve the situation with American access to mainland markets. Earlier United States announced that it plans to impose duties on Chinese imported goods, which worth in total $ 60 billion, and other restrictions, which caused China to respond. This has led to the strongest fall in US markets in last two years. This Sunday US Treasury Secretary Stephen Mnuchin said that the presidential administration "is exploring the possibilities of reaching an agreement to ensure fair trade, as the Chinese understand it. If we will take into account that last week the indices declined, basing on the fears of trade wars beginning, especially between the US and China, then a sudden positive event for the market will somehow be recouped in one day, or maybe the whole week. 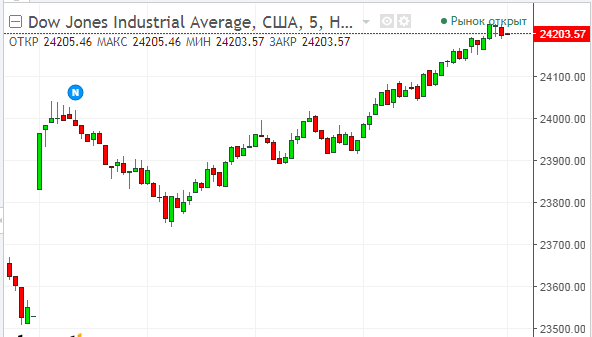 At the moment, futures for US indices are already adding more than a percent, and the imminent opening of the stock market will cause a gap down. In such situations, of course, it would make sense to buy already in the European session - but such situations can be met less frequently. Therefore, on ordinary days for beginners it is better not to open positions on American indices in the European session, but to wait for the start of the stock session in the US. Now, after the opening of the stock market and after the first spurt upwards, there may be another attempt to go to the lower levels - therefore, it is always better to wait for some pullback down before buying. In rare cases, a downward roll may not happen, but such cases are very rare. What drives stock assets growth ? Growth is driven by such an indicator as "risk appetite." Shares are risky assets - in contrast to the so-called defensive assets, which include the yen and the US government bonds, as well as the Swiss franc with gold. The riskiness of shares means that their purchase is a rather risky investment - prices can drop by tens of percent, which does not compensate any income that can be received on them in the form of dividends (fixed payments for the company for a certain period). Shares can decrease not only on their own company performance, they can do it for almost any reason, when a crisis situation arises in the world: terrorist attacks, conflicts, wars and other negative factors. All this dramatically reduces this risk appetite. If everything is more or less normal, the situation is calm, etc. and shares (more precisely, stock indices) usually grow, since they have a long-term growing trend. But if the situation in the world and the country becomes aggravated, we immediately see a reaction on risky assets - stock indices begin to decline, which reflects the exit of investors from risk. Now, after the opening of the stock market and after the first spurt upwards, there may be another attempt to go to the lower levels - therefore, it is always better to wait for some pullback down before buying. Everything, that I have described above, happened exactly like this (as can be seen from the graph below) - after the gap at the opening the index grew in the first minutes and after half an hour it began to decline. It fell for about an hour and a half, closing about half of the gap - a technical level of 50% correction, besides it shows the strength of the market since the gap was not completely closed.